Enhanced road markings will increase the visibility of bus lanes. 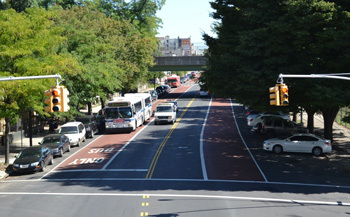 Many bus lanes are colored with dark red terra cotta paint, and all bus lanes include white BUS ONLY markings. The red treatment has been shown to help make sure motorists are aware of the bus lane, and do not drive or park in the lane during restricted hours. Curbside bus lanes are travel lanes for buses at the curb. Curbside bus lanes are only in effect during certain times of the day and can be used by regular traffic during other times. For hours of operation, check the on-street curb regulation sign. Off-set bus lanes are travel lanes for buses one lane away from the curb. These lanes serve buses as well as right-turning traffic and emergency vehicles. The lane next to the curb may be used for parking, loading, or kept entirely clear. 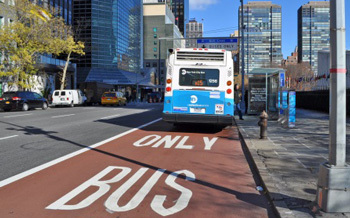 Bus lane cameras are used to enforce bus lane rules on selected streets around the city; cameras may only be used on specific corridors authorized by the New York State Legislature. All potential camera violations are reviewed by a DOT employee before being issued, to ensure that a violation took place. 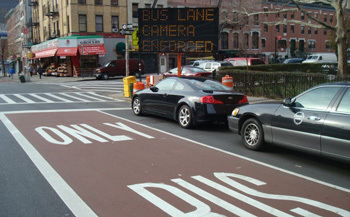 On all corridors, DOT works closely with the New York Police Department to enforce bus lane rules. All bus lane violations are adjudicated by the Department of Finance, not by DOT. 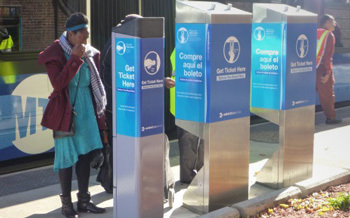 Off-board fare collection means that bus riders pay with a MetroCard or coins at a sidewalk ticket vending machine at the Select Bus Service bus stop before they get on the bus. Riders may then board the bus through any door, without needing to show the ticket to the bus operator. This shortens the time the bus is stopped at the station substantially, compared to the traditional method of entering one at a time through the front door. NYCT employs fare inspectors who may randomly inspect tickets to ensure compliance; passengers without a ticket are subject to a $100 fare evasion summons. 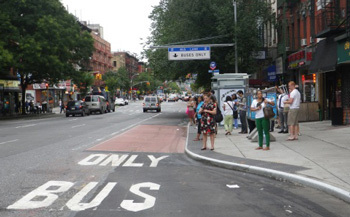 Bus bulb stations are locations where sidewalks have been widened to meet an offset bus lane or general travel lane. Bus bulbs provide more room for people to wait, provide more room for amenities like bus shelters, benches, and greenery, and they allow buses to travel straight into and out of the station without pulling over. These stations also have a high curb wherever possible that will be near-level with the floor of the Select Bus Service buses, making it easier and faster for all passengers to get on and off the bus. Transit signal priority, uses GPS to track when a bus nears an intersection, and turns traffic signals green sooner, or keeps them green longer, allowing the bus to keep moving through the intersection and shortening the overall time of the bus trip. Implementing transit signal priority also includes coordinating the traffic signals on the corridor for all vehicles, which improves travel times for both buses and other traffic on the street. 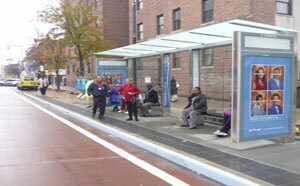 Minimum bus stop spacing allows buses to travel faster by not having to stop very frequently. Select Bus Service routes have a simple route pattern with stops farther apart than typical bus routes, such as at major destinations or transfer points. Local buses will typically continue to serve all stops. Real time arrival information provides riders with how far away the next arriving bus is, as provided by the MTA Bus Time system. Real-time information can be viewed on real-time signs located at bus shelters and is available by cell phone or over the internet. Upgraded signage on all routes will establish when the bus lanes are in effect. At a minimum, this will include at least one sign per block, positioned for high visibility for motorists. Additionally, large overhead signs will be located along the corridor to ensure that the rules of the road are clear. Pedestrian and driver safety is an important aspect of SBS design. Features such as neck-downs and pedestrian islands are used to shorten crosswalks and increase safety for pedestrians while enhanced street organization improves safety for drivers, bikers, and pedestrians alike. 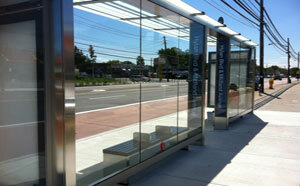 New bus shelters are installed by Cemusa, the city’s bus shelter franchisee. Bus shelters are installed at all Select Bus Service stations where physically feasible, with double shelters used where possible.